EZ Breathe helps to prevent ice dams by reducing the stack effect, thereby preventing excessive warm air from rising. This will help keep the roof cooler, so the snow won’t melt and lead to the formation of ice dams. An ice dam is a ridge of ice that forms at the edge of the roof and prevents melting snow from draining off the roof. Warm air leaking from the house into the attic is the primary cause of ice dams. 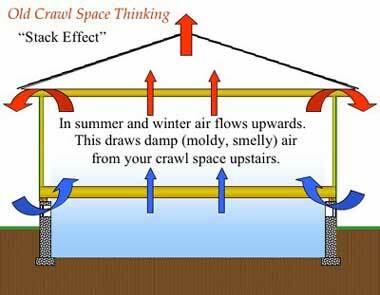 Sealing attic air leaks saves energy and is helpful to preventing ice dams. 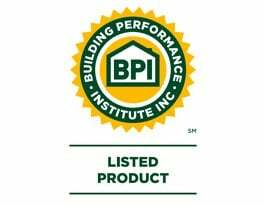 By creating foundation ventilation at the very bottom of the home, in the basement or crawlspace, the natural tendency for heat to rise will be diminished. By exhausting the stagnant, often times dirty, damp air from the foundation, the warmer, drier air from upstairs will travel down to replace that damp, dirty air. This slight negative draw will not only keep excessive heat from being lost through the roof, but will also create a healthier environment in the whole home by creating a path of escape for indoor pollutants residing in the basement/crawlspace that would otherwise get drawn up by the stack effect into the living environment creating a poor indoor air quality throughout the home. EZ Breathe Ventilation System will improve the indoor air quality in your home while protecting your home from damaging ice dams! Icicles form and can grow to gigantic sizes. These icicles, and the large mass of ice behind them, break off and can cause roof, gutter and siding damage, as well as injure, and even kill, people who are unlucky enough to be underneath them when the fall off. Reduced effectiveness of insulation. Wet insulation doesn’t work well, and chronically wet insulation will not decompress even when it dries. Without working insulation, even more heat will escape to the roof where more snow will melt, causing more ice dams which, in turn, will lead to leaks. Additional insulation—especially on the top plate of exterior walls—can reduce heat transfer to the roof deck, but insulation alone is insufficient. Contact us today to learn more or request a free quote!